Photographer Joseph Sohm (left) and Composer Roger Kellaway (far right) stand with a cut-out of Boston Pops Conductor Keith Lockhart. 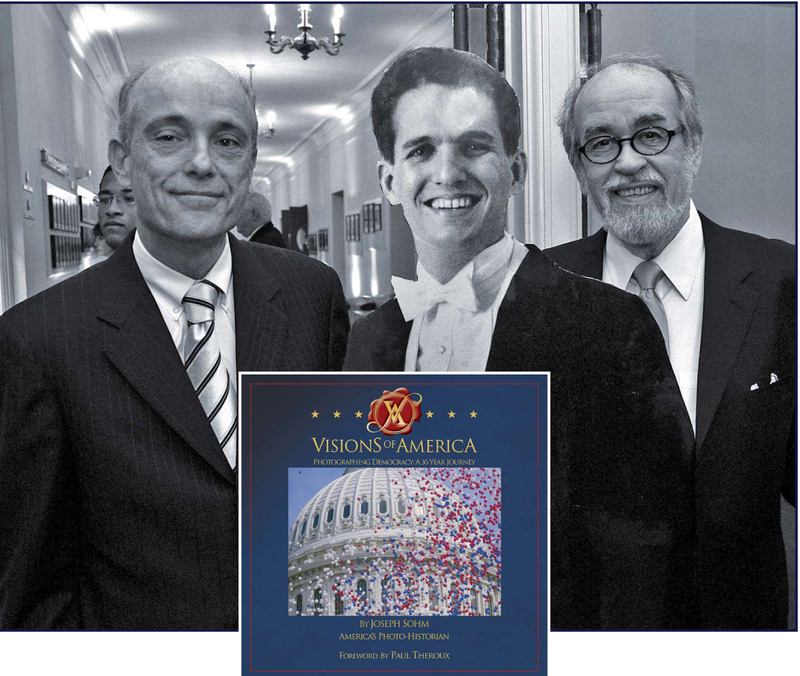 Foreground image: Sohm’s award winning book Visions of America. Donna Granata interviewed both Roger Kellaway, Grammy winning musician, and America’s Photo-historian, Joseph Sohm, separately and together. Internationally renowned jazz pianist and composer, Roger Kellaway has recorded numerous CDs and has written for film, television (All in the Family), and theatrical productions. Sohm and Kellaway collaborated on Visions of America, an orchestral multimedia portrait of Democracy. Joseph Sohm’s guiding vision for this collaborative effort is a single question: “How do you photograph democracy?” This question fueled Sohm’s epic journey across all fifty states in search for America’s beauty, its vastness, and the icons that have inspired millions. Sohm’s recently published award winning book, also entitled Visions of America, is indeed awe-inspiring and will be reprinted by Readers Digest in 2012. His images have been published more than 100,000 times in the worldwide media through his agents Getty Images and Corbis. In May 2012 the Boston Pops kicks off its 2012 concert season with Visions of America. The theme continues throughout the season as the Pops celebrates many of America’s greatest musical traditions, featuring Joseph Sohm’s striking images from all 50 states. The season’s theme culminates in Visions of America Photo Symphony Concert for America, a multi-media composition created by Joseph Sohm, Oscar-nominated Roger Kellaway, Oscar winning songwriters Alan and Marilyn Bergman, and narrated by Clint Eastwood. The concerts feature vocal performances by Grammy winning Patti Austin. Kellaway’s documentation took place in 2012 and was sponsored by Paula Spellman. The AfterGLOW was held at The Comedy Club in Ventura with a special cameo appearance by Academy Award winning songwriters Alan and Marilyn Bergman. In addition, there was a short performance with Alan Bergman and Roger Kellaway.